Bud is aiming for young people. Some suggestions for getting it right. Millennials like beer. (So do older people.) 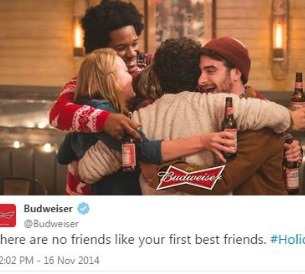 But they’re not really feeling Budweiser these days. The iconic American brand has fallen to third most popular behind Bud Light and Coors Light. Moreover, craft beers are making inroads with young drinkers. That category makes up 15 percent of this demographic’s out-of-home beer purchasing. According to numbers quoted by The Wall Street Journal, 44 percent of adults between the ages of 21 and 27 have never tasted Bud. In 1988, Bud sold 50 million barrels of beer. Last year, it was 16 million barrels. This 21-to-27-year-old age group is where Bud will be focusing its future efforts. “That means it won’t trot out the traditional Budweiser Clydesdales for this year’s holiday advertising. It means February’s Super Bowl ads will feature something more current than last year’s Fleetwood Mac. It means less baseball and more raves with DJ group Cash Cash,” said the WSJ. Uh-oh. That approach has all the makings for something that will be cheesy and easily dismissed. It’s like when your mom tried to have a one-on-one with you that time and opened up the conversation by asking for your thoughts on the new Taylor Swift album or something. No mom. So the first bit of advice that we’d like to share with Bud: Don’t try too hard. The Journal article goes on to say that the brand is going to sponsor food festivals. That’s fine. But make sure it’s the right festival. Something involving grilled meat perhaps. If Bud shows up at a fine dining festival, it’s going to stick out like a sore thumb, and not in a good way. The plan also includes getting back on tap at bars and greater presence in college towns around the time of its big Made in America music festival. That’s a smart plan. Throw in some free food truck fare and you’re cooking with grease. This is the sort of food-and-beverage pairing that makes sense. Next suggestion: Introduce a limited edition version of the beer. Bud isn’t perceived as being a beer that someone with more discriminating tastes would drink. Craft beers offer variety, something to savor. A limited edition batch would make people rethink just how serious and knowledgeable Budweiser is about taste and flavor. And if the limited edition is a winner, you have something that you come back to a few times per yer to generate excitement, like the McRib. Finally, have fun. 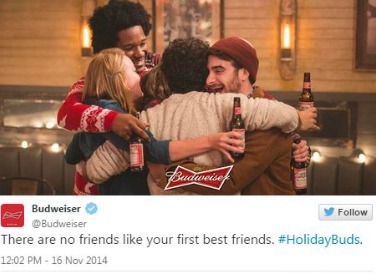 Budweiser’s Twitter page is filled with the #HolidayBuds hashtag. Attached to it, lots of carols and nostalgia and Christmas lights. Which is great. But the brand is so iconic, it’s strong enough to sustain a fun campaign that toys with new ways of appreciating it. Vine videos, maybe an appearance on Drunk History, some fun live events… these are things that will show that while Budweiser is serious about beer, it’s also what you want to have around when you’re having a good time with a good beer-loving group of people.